San Francisco, CA — An estimated 1,000 criminal cases will be reviewed following revelations that San Francisco police officers regularly shared racist and homophobic views in text messages, San Francisco Public Defender Jeff Adachi announced today. The Public Defender today also released a 10-point plan to increase police transparency and safeguard citizens against racial bias. Adachi said he will work with San Francisco District Attorney George Gascón to review criminal cases over the past 10 years that may have been tainted by former sergeant Ian Furminger and four current officers, identified in the press as Michael Robison, Noel Schwab, Rain Dougherty and Michael Celis. The officers sent epithet-laden text messages denigrating blacks, gays, Filipinos and Mexicans. The texts revealed in a court filing by prosecutors in Furminger’s federal corruption case. Furminger was convicted in December of robbing drug suspects. “The messages make clear the utter contempt these officers had for the people they were sworn to protect. You can’t simply set aside this kind of extreme bias when you go to work. It affected who they chose to detain, search and arrest. It affected which witnesses or crime victims they chose to believe,” Adachi said. The Public Defender’s Racial Justice Committee today also released a 10-point plan for police reform. Its key recommendations include increased training on implicit bias; an annual review for supervising officers that screens for racial bias, excessive force, unlawful search and false reports; and an increased effort to assign positions in black and brown communities to officers who live in the neighborhoods. The Racial Justice Committee was formed in 2013. It partners with the University of Pennsylvania’s Quattone Center for the Fair Administration of Justice to track and remedy racial disparities in San Francisco’s criminal justice system. Co-chairs Christopher Hite and Rebecca Young said the committee worked on the 10-point plan over the past year. Committee members hope the document will serve as a starting point for the adaptation of meaningful reforms. San Francisco youth who have faced police bias firsthand also spoke at today’s press conference. Nico Bremond, a USF graduate and youth mentor in the Western Addition, described calling police for help after his apartment was robbed, only to be accused of selling drugs. Bremond, who is Latino and African American, said he regularly feels police regard him suspiciously when he is living a lawful life. 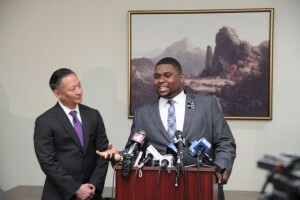 Former San Francisco Youth Commissioner De’Anthony Jones, who is African American, described an incident in which he ended a police encounter by offering to shake the officer’s hand. The officer refused, he said. Reading the text messages “hurt me to my soul,” the Sacramento State University graduate said. “We need to attract more young men and women of color to the police department, but the kind of hatred displayed in these text messages makes that mission difficult,” he said.